I support the Oxford Comma. Some of you are giving me a virtual fist-bump. Others are rolling their eyes. Some of you are shrugging your shoulders and going back to web-surfing. For those still reading, here’s why I prefer the Oxford Comma, which is also known as the serial comma: it makes reading easier and, more importantly, clearer. 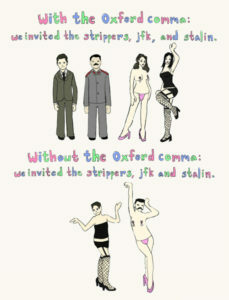 I’m not alone in my appreciation for the Oxford Comma. Milk truck drivers in Maine are also fans, after winning $10 million in back-pay for overtime in a lawsuit that came down to a missing comma. Grammarly says it’s a stylistic choice in most cases (some style guides require its use, others do not), but offers an example of when the Oxford Comma can make a big difference. Which sentence is clearer? I’ve chosen my side: I’m with the Comma Queen. Whose side are you on? Find this stuff as fun as I do? Click here for Mary Norris’ video series for The New Yorker, including this short video about why the Oxford Comma is useful–and when it may be okay to leave it out. Not a grammar fan? Since I do enjoy editing and proofreading, I’d love to help make your online content, white papers, and other outreach materials the best they can be. Contact me at elinore@kecommunications.net.